The terms he has used to describe the impending Trump presidency are pretty much the same ones his State Department used to condone Brazil’s putsch. Likewise, in 2012, Obama didn’t join with other Latin American countries to denounce a similar “soft,” or constitutional, coup—that is, the overthrow of a democratically elected government through formally legal or procedural mechanisms, such as impeachment proceedings—in Paraguay, which removed another center-leftist from power. Obama’s State Department, then run by Hillary Clinton, only urged that “democratic principles” be respected. In Honduras in 2009, after a few initial criticisms of yet another constitutional coup, Obama largely ceded the issue to Secretary Clinton, who worked to legitimize Honduras’s new regime. So the irony is bitter. After helping normalize the transition to neoliberal authoritarian rule abroad, Obama, in the last weeks of his presidency, now finds himself doing the same at home. The terms he has used to describe the impending Trump presidency are pretty much exactly the same terms his State Department just used to condone Brazil’s putsch: the resiliency of democratic institutions… the need to accept the ups and downs of electoral competition… the rule of law… and so on. 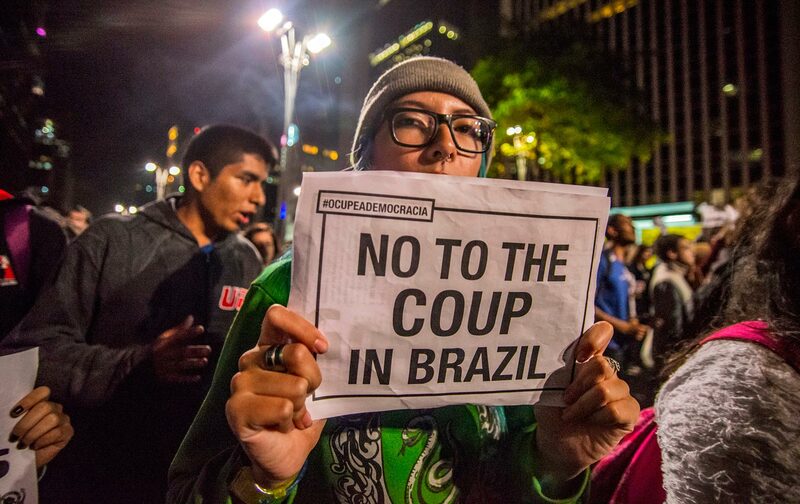 On Brazil’s coup, a White House spokesperson said that Obama “has faith in the capabilities of the democratic institutions of Brazil to hold up against political turbulence.” “That’s the way politics work sometimes,” said Obama, certifying the legitimacy of Trump’s election (which, considering the Electoral College, voter suppression, and the gutting of the Voting Rights Act, is as genuine an expression of democratic will as was the overthrow of Brazil’s Rousseff or Honduras’s Manuel Zelaya). There’s yet a second irony: Most of Latin America’s new market authoritarians were hoping for, and expecting, a Hillary Clinton win. Years ago, I argued that the rise of Latin America’s New Left offered Obama a unique opportunity to reverse the Democratic Party’s disastrous embrace of “free trade.” Obama took office in 2009, at the height of the power and popularity of Latin America’s newest left, which offered a model on how to respond to demands for both economic justice and the political rights of historically super-exploited groups. In Latin America, in other words, there is no divide between so-called “identity politics” and “class” politics. What Bernie Sanders is now calling for in the United States is what the Latin American left had long ago achieved: a synthesis of recognition and redistribution, of social and civil democracy. A few years before Obama’s election, in 2005, Brazil, Argentina, and Venezuela joined forces to do to the proposed Free Trade Area of the Americas (FTAA) what so many Trump supporters want to do with NAFTA: scuttle it. And they did so not in the name of racist xenophobia and blood nationalism but rather the best egalitarian, humanist, and universal social-democratic values. Did post-1998 economic populists and social democrats make mistakes? Of course, including corruption, nepotism, and, in many cases, bad economic policy. But in retrospect, they also presided over stunning successes, including significant reductions in poverty; expansion of political democracy; and advancement of gender, racial, and sexual equality. Obama should have embraced the Latin American left, which was eager to have Obama as a comrade in their narrative of New World racial and economic progress. Instead, Obama restored the Clinton wing of the Democratic Party that he had vanquished in the primaries and embraced Latin America’s neoliberal opposition. He not only helped normalize the coups mentioned above, but also responded to the defeat of the FTAA with the horrendous Trans-Pacific Partnership, which, in addition to being a corporate giveaway, was meant to isolate Brazil, Argentina, and Venezuela by hiving those oppositional governments off of more cooperative Pacific Rim economies, such as those of Peru and Chile. With the coup in Brazil, the recent election of bond-market favorite Mauricio Macri in Argentina, and chaos in Venezuela, that objective is no longer necessary; but the mooting of the TPP before the US election only added to Hillary Clinton’s many liabilities. Neoliberalism in Latin America, both in its original Pinochet edition or in its current restored iteration, is authoritarian and repressive. As in the United States, it is simultaneously a cultural project—aimed at containing, either through the market or policing, demands for political rights by oppressed groups—and an economic project of accumulation. Take a look at Brazil’s all-white, all-male post-coup government, which is as intent on rolling back the affirmative anti-racist policies of Dilma Rousseff’s Workers’ Party as it is on cutting spending, dismantling welfare programs, and repressing social movements. In Peru, for another example, state repression against indigenous communities fighting to control local resources and regulate extractive industries has been fierce. In this sense, then, Latin America’s new neoliberal authoritarians would seem to have much in common with Donald Trump’s political project of bolting white nationalism to deregulation. But the region’s neoliberals were ready for Hillary. Brazil’s foreign minister had “openly called on Americans to vote for Clinton,” describing a potential Trump victory a “nightmare.” Peru’s new president, Pedro Pablo Kuczynski, a former World Bank technocrat and investment banker—who himself barely beat back a Trump-like right-wing movement—had said that Peru would cut off relations with the United States if Trump wins. In Argentina, Macri, since taking office in April, has executed a very Trump-like economic agenda: He’s cut spending on health care and education and reduced the government payroll, as well as liberalized money markets and devalued the peso. That’s the neoliberalism. Here’s the authoritarianism: According to one report, “starting in February, Macri’s administration established a protocol—with little input from human rights civil society organizations—guaranteeing the right to social protest only if it ‘does not limit the freedom of movement of people [and capital].’” Macri sounds like he would be a well-suited martinet in Trumpworld. Yet Macri bet on a Clinton win. According to Mark Healey, a historian of Argentina, the Argentine president, by aligning with Clinton, took the opportunity offered by the US presidential campaign to rebrand Argentine anti-Peronist conservatism as modern, open, and forward-looking. “Macri openly campaigned for Hillary,” Healey says, having “made some smirking comments about Trump in public interviews just a few weeks back.” In the case of Argentina, there’s also a unique backstory to Macri’s distrust of Trump: Decades ago, Trump drove Macri’s father, Franco, out of the New York real-estate market; Franco even once floated the idea that it was Trump who had Mauricio Macri kidnapped and held for ransom back in 1991. To sum up: Clintonism, in its original form, gave Latin America’s new neoliberals the blueprint from which they hoped to build on. Especially, Bill Clinton’s three signature Latin American policies—NAFTA, Plan Colombia, and border militarization—were the concrete applications of neoliberalism’s three platonic ideals: deregulation, or laissez–faire; repression; and containment. NAFTA represented the deregulation and free flow of capital and goods; Plan Colombia (which has since been extended to cover Central America and Mexico) represents the increasing use of the military and police to respond to the social problems created by deregulation; and border militarization helps contain surplus humans, displaced as a result of deregulation and repression. Sounds a lot like what we might expect from a Trump foreign policy, no? Except that Latin America’s new neoliberals had teed up for a Hillary Clinton White House. They were expecting, under a Clinton presidency, to integrate their economies and policing policies into a new hemispheric unity, under US leadership—under some kind of expanded, or enhanced, TPP (Macri, for instance, had said he would take Argentina into the TPP). In contrast, Trump’s new nationalism, at least as so far expressed, precludes any such integration. So far, Trump has expressed very little interest in Latin America. NAFTA and the TPP became targets during the campaign, but he hasn’t mentioned other existing free-trade treaties, with Colombia, for instance, or Peru and Central America, that comprise the neoliberal regime. I imagine he’ll maintain the high levels of military aid that Washington provides to Mexico and Central America. NAFTA has been a disaster, on both sides of the border, but at this point any attempt to renegotiate it, especially in ways that would give the United States even more of an economic advantage, could prove a greater catastrophe for Mexico, especially for its export maquiladora industry, which pays miserable salaries but employs a significant number of workers. If shut down, it could lead to a spiral of unemployment, migration, and violence that, given the apocalyptic visions of Trump supporters, would turn the borderlands into even more of a death zone than they already are. And without an overarching vision such as a new Free Trade Area of the Americas, China’s economic and political influence will continue to grow, turning what was America’s backyard into a geopolitical battleground between Washington and Beijing.